24x 00 Gauge SL-10 Code 100 & Code 124 Fishplates (Rail Connectors) With Prewired Power Takeoff For DCC & DC Layouts. Wiring Is Side Soldered To The Fishplates (No Cutting Sleepers To Make Them Fit, No Electrical Glue Or Crimping Here). Wiring Is Side Soldered To The Fishplates (No Cutting Sleepers To Make Them Fit, No Electrical Glue Or Crimping Here). New and unused. Easily accessible from the main A55 with free parking outside. This item is New and Unused. Add to Favourites. Deluxe Materials AD57 Roket Card Glue. Deluxe Materials AD25 Scatter-Grip Tacky Glue. 80 thou (.080") 2.0mm thick clear plastic card. Expo 73545 No.234 Razor Saw Blade (fits X-acto). You might also like. Cables Are Side Soldered To The Fishplates (No Cutting Sleepers To Make Them Fit Or Electrical Glue / Crimping Here.). 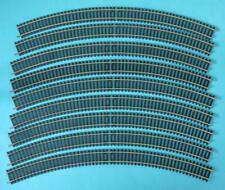 OO / H0 gauge READY WIRED set of 20 fish plates for dcc bus wiring or dc power feeds. Good quality 10 amp wire. made with good quality solder. 12x 00 Gauge SL-10 Code 100 Fishplates (Rail Connectors) With Prewired Power Takeoff For DCC Layouts. Wiring Is Side Soldered To The Fishplates (No Cutting Sleepers To Make Them Fit, No Electrical Glue Or Crimping Here). Then try my pre-wired rail joiners. Just a neat tidy job. FINESCALE rail joiners (TT & HO/OO), three of each Red / Black. 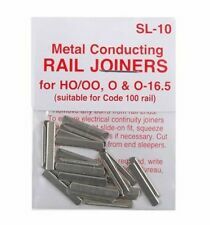 Is not being able to solder to the rails, stopping you from building a better layout?. BULLHEAD RAIL ONLY rail joiners ( Not standard code 75 rail), three of each Red / Black. Then try my pre-wired rail joiners. Just a neat tidy job. 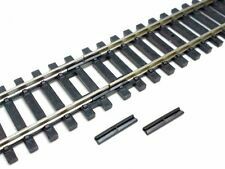 Is not being able to solder to the rails, stopping you from building a better layout?. 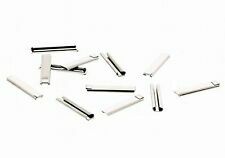 PECO IL-20X - 25 x SCALE SIZE FISHPLATES FOR CODE 100 4mm FLAT BOTTOM RAIL - NICKEL SILVER. made with love by. 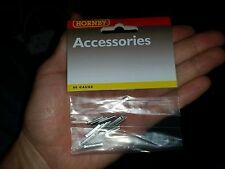 This 'Buy it Now' is for 8 pieces of Hornby R609 Nickel Silver 3rd Radius Double Curves, all with Fish Plate issues. These shorter joiners (just over 5mm in length!). Used model railways & collections always wanted. HS1-9, IV41-53, 55-56, KA27-28, KW15-17, PA20, 41-49, 60-78, PH42-44, ZE1-3 (48-120 Hours subject to ferry schedules and weather) Up to 20 kilos £25.99. PECO IL-21X - 25 x SCALE SIZE FISHPLATES FOR CODE 95 4mm BULLHEAD RAIL - NICKEL SILVER. made with love by.